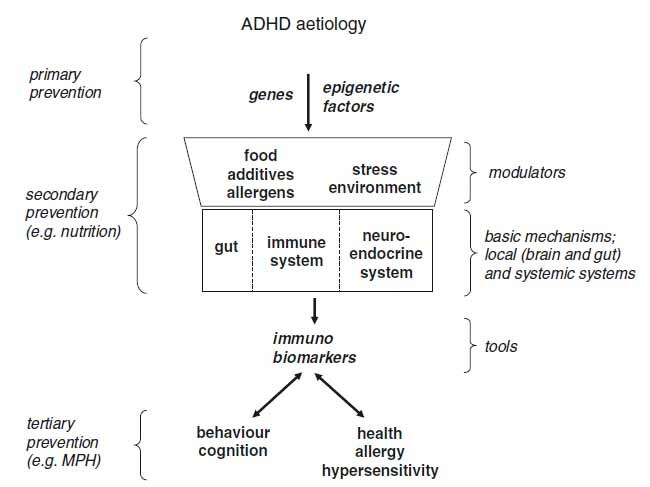 Verlaet 2014: Nutrition, immunological mechanisms and dietary immunomodulation in ADHD. Fig. 1. Schematic representation of prevention levels in ADHD. Click to enlarge. European Child & Adolescent Psychiatry, 2014 Jul;23(7):519-29. Verlaet discusses the common causes of GI problems, asthma, eczema, ear infections, and ADHD – involving both genes, immunity, and inflammation. An immune imbalance can be related to food provoking ADHD-like behavior. Food dyes, however, may involve “pharmacological mechanisms” causing chronic inflammation and oxidative stress which can lead to ADHD symptoms. This entry was posted in 2011-2015, ADHD, Asthma, Dermatitis, Ear Infections, Eczema, Food Dyes, Genetic, GI Problems, Hyperactivity, Immune System, Review, Editorial or Speech. Bookmark the permalink.